About a month and a half ago, I felt it shift when I bent over to vomit. Since then, it's caused me nothing but pain. I followed up with the PA on Friday, and she did trigger point injections all around the stimulator site to ease up some of the more tense muscles. I cried because it hurt so badly. She told me to follow up with the doctor on Monday, so I did. I went and saw the spinal cord stimulator doctor yesterday, the same doctor who put it in for me. He confirmed what I said, that it had shifted. Instead of lying flat, like it's supposed to, instead, it is more of a 90 degree angle. He scheduled me for back surgery on Monday at 3:30 EST. 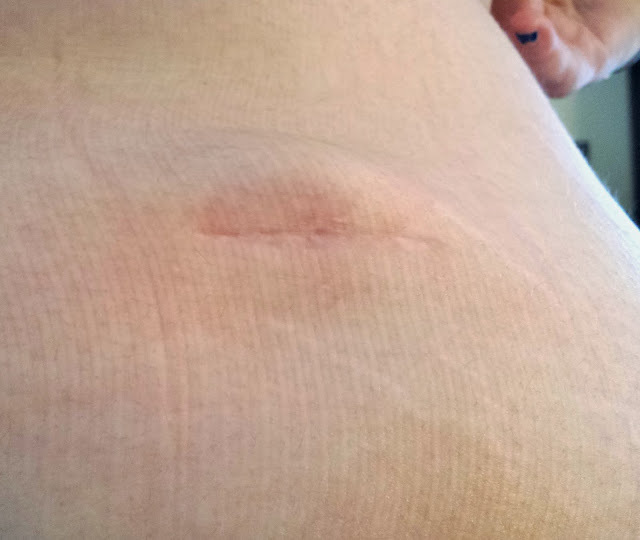 He said that they'll try and put it back where it was but more than likely, they would have to make a new incision and put it somewhere else. I guess it didn't heal enough and the gastroparesis made it worse. So, now, I have back surgery on Monday and I'm nervous, even though I've had it done before. The last time I was put under anesthesia, I died twice. So, definitely nervous this time. But, I'll get through it, I always do! I'll let you guys know how the surgery goes. Below is a picture of my stimulator. You can see how badly it's sticking out. I wish I could take a better picture but it's almost in such an awkward place in my back that it's hard for me to get a good shot of it. What is the spinal cord stimulator for, you ask? In 2009, while at field camp, I lost my footing and slid down a mountain on my knees. They couldn't find anything wrong with my knees except for nerve damage. The stimulator is like having a TENS unit in your back, and it blocks out the pain signals of the nerves for relief. It reroutes the pain signals so that my knees and back shouldn't hurt anymore. It does help, tremendously and allowed me to hike again until I kept bending over to vomit and knocked it out of place. Physicians generally use this type of spinal decompression when attempting to heal medical conditions such as sciatica, neck pain, back pain, degenrative, herniated or bulging discs. It can also help treat injured or diseased nerve roots or worn joints in the spine more.